U.S. Army Staff Sgt. Carl Piper is modest when asked about receiving the 2017 Flight Medic of the Year award by the DUSTOFF Association, an organization for officers and enlisted Army Medical Department personnel and others who support Army aeromedical evacuation programs. In fact, Piper, who received critical care training through UT Health San Antonio’s Army Flight Medic program, initially tried to talk his commander out of nominating him for the award. “Anyone would have done the same thing I did,” the flight medic posted in Colorado Springs said of his service. His efforts were unsuccessful, and Piper received the award in San Antonio on April 1. Piper praised the commitment of his instructors during his three-month course at UT Health San Antonio and credited them with motivating students to expand their skills. “You could see them feeding off of our passion and just pushing us to the next level,” Piper said. Piper put what he learned in the course into practice and the payoff has been clear. When Piper joined the Army in 2009, he served as an infantry medic in Germany. He said he always felt comforted to know that there were flight medics ready to care for and support him. “It was knowing that even on our worst days it would be a little better knowing we had someone that would support us,” he said. According to the DUSTOFF Association website, DUSTOFF was the radio call sign for the first aeromedical helicopter evacuation unit in Vietnam, which arrived there in 1962. The DUSTOFF organization’s motto is Dedicated Unhesitating Service to Our Fighting Forces. 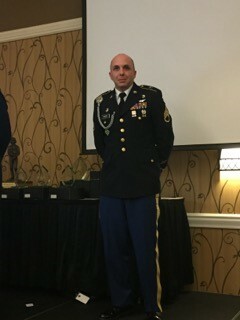 Lance Villers, associate professor and Chair of the Department of Emergency Health Sciences, said the award is recognized by the Army. In other EHS news, two faculty members recently earned advanced degrees. Leslie Hernandez, M.A.Ed., NREMT-P, director of community education, earned her Ed.D. in Adult Education from Capella University and Sarrissa Ryan, clinical education specialist, earned a master’s in health sciences with an EMS Leadership major from George Washington University.